In the world of today, moving across the country or even overseas is a real possibility, and with a move like that comes logistical nightmares of getting all of your possessions from one location to the other. One thing you won’t have to worry about is moving your vehicles long distances if you trust Door to Door Transport. At Door to Door Transport we have over 25 years of experience in moving vehicles long distances. We are a family owned and operated business that has the best interests of our clients and their vehicles at the center of all we do. Making a big move is stressful on the entire family. Let us take some of that stress away. Whether you are moving one vehicle or more, whether you have a family vehicle or a classic muscle car or whether you need to move across an ocean, we have you covered. We are fully bonded and insured so that you and your vehicle are protected and we take our job seriously. When you decide to move your vehicle through auto transport there is one major decision to make. There are two types of transport to consider when using auto transport: open car shipping and enclosed car shipping. The method you choose is totally up to you, but you should know the top four reasons to consider enclosed auto transport before you make a decision. 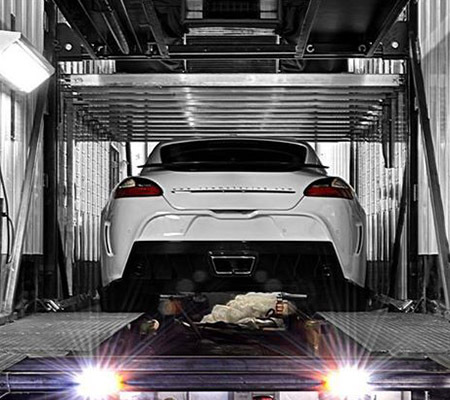 Enclosed auto transport services have some advantages over open auto transport services. 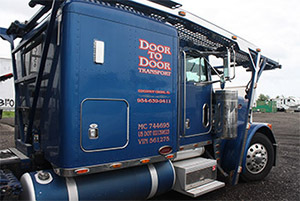 At Door to Door Transport we offer both options, and we want you to make an informed decision. While enclosed auto transport services are more expensive, there are many advantages. Here are the top four reasons to consider enclosed auto transport to move your vehicle. Your car will be given the “white glove” treatment while in our care with enclosed auto transport services. No detail will be left undone. Your car will arrive in the exact some condition in which you gave it over into our care. Your car or truck will arrive in immaculate, top notch condition to your new home. In an enclosed environment, your car will not be subject to flying debris that could hit it while in transport. Even though open car transports are very safe and secure, there is still the risk of a rock or other object flying up from the road hitting your car and causing damage. While enclosed inside a trailer, not even bird droppings will touch your paint job. Your car or truck will not be exposed to the elements in an enclosed environment. No rain, sleet, hail or any other type of weather related condition can damage your vehicle when traveling in an enclosed transport. A soft latch with cables and straps is used to secure your car inside an enclosed transport. When traveling on an open air car transport trailer, the car must be attached to the trailer with chains that are then attached to the frame of the car. When you consider the options for moving your vehicle, enclosed auto transport services may be for you if the above advantages are to your liking. While open air transport is perfectly fine for most vehicles, enclosed auto transport services become more attractive, despite the extra cost, if you have a luxury vehicle or a classic car that could not be easily replaced if damaged. When you have spent thousands more for a vehicle than the average family car, you want to make sure you protect your investment with enclosed transport. You never know what might happen on the road. Trust us to get your vehicle where you need it with our door to door service. It’s not just our name; it’s what we do! In most cases we can pick up and deliver right to your door. When necessary, due to community restrictions or the limitations of our trucks, we may need to meet or deliver to a terminal, but rest assured we will work out the best possible method for your convenience. Call us today at 866-802-7447 or use our convenient free quote request on our website at www.doortodoortransport.com to schedule your enclosed auto transport services.